Published in: Obieg, 2007, no 1-2 (75-76), pp. 10-37. 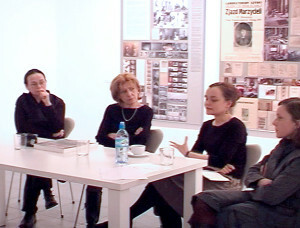 Presented below is an authorised transcript of the discussion that took place in connection with Zofia Kulik’s exhibition Made In USSR, GDR, Czechoslovakia and Poland at Le Guern Gallery in Warsaw (November 29, 2006). The subject of the panel was the KwieKulik archive created by Zofia Kulik and Przemysław Kwiek during their collaboration in 1978-1987, part of which was presented in the exhibition. 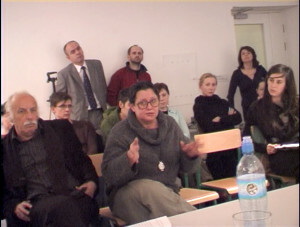 The vast archive was formed as part of KwieKulik’s Action, Documentation, and Distribution Workshop (Pracownia Działań, Dokumentacji i Upowszechniania, PDDiU). 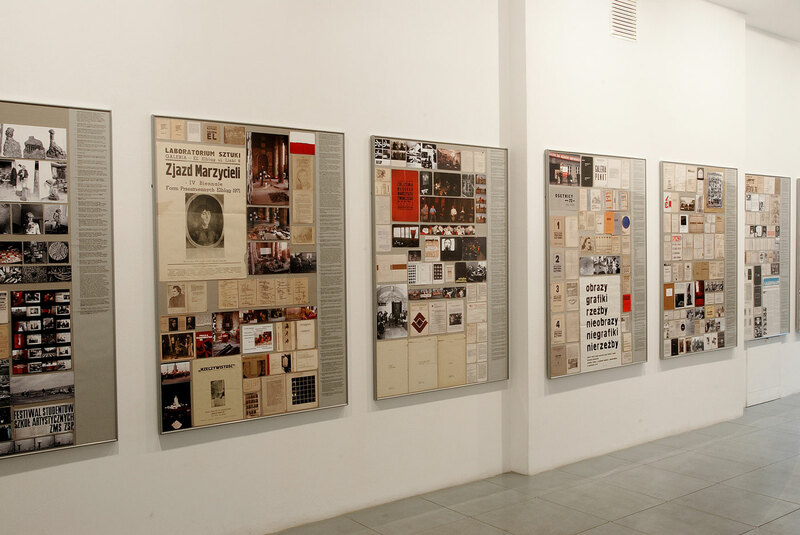 The fragment of the archive presented at Le Guern Gallery, entitled From the KwieKulik Archive included nine large-format panels composed by Zofia Kulik (in their original version presented as part of the exhibition “Interrupted Histories” at Moderna Galerija, Ljubljana, in 2006). The KwieKulik archive found an unfolding in the exhibition in Zofia Kulik’s photographic collage Made In USSR, GDR, Czechoslovakia and Poland a travesty of Hans Holbein’s Ambassadors. 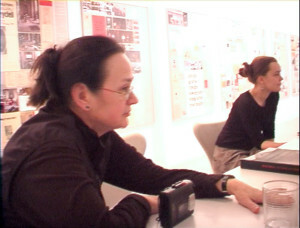 As the ambassadors, the author put the images of herself and Przemysław Kwiek, surrounded by film and still cameras and other pieces of equipment used by KwieKulik. Bożena Czubak: The problem of the archive has been intensely discussed in the recent decades. It entails other topics: the collection, the museum, the art institution, and, of course, the relationships between them. Besides, the question of the archive emerges in the context of contemporary art history, the issue of nonexistent archives, and, given the absence thereof, of the way art history has been – or hasn’t been – written. The issue of the unwritten history of the art of the recent decades emerges very powerfully in the context of Zofia Kulik’s Made in USSR, GDR, Czechoslovakia and Poland. The fragment of the KwieKulik archive presented as part of this exhibition is a narrative of a personal perception of this history, a narrative, far from being chronological, written by the author herself, who also archivises herself as part of it. We are all well aware of the important role of the archive in the context of Zofia Kulik’s artistic practice. We remember how often terms such as ‘archivisation’, ‘collection’, or ‘gathering’ have been used in relation to her work. Many of Kulik’s works were made on the basis of items from her own photographic archive 1 It is necessary to discern between the archive created by the KwieKulik duo and the photographic archive created by Zofia Kulik herself for the purposes of her individual practice.. Her working method, her collecting passion, have been mentioned in the context of the curio cabinet, of Aby Warburg’s Mnemosyne Atlas, of the practice of collecting images and studying them, or rather ‘reading between the lines’ of them. One can also mention Walter Benjamin’s Passages here. In a sense, Zofia Kulik’s From Siberia to Cyberia is one great archive. It’s worth noting the publication accompanying it, on the cover of which we see an image of the artist’s house, where the KwieKulik and her own, both almost legendary now, archives are stored; the house where she archivised TV images in order to weave with them the history of the 20th century, written with her own vision, spread symbolically between references to Siberia and Cyberia. Jacques Derrida wrote about the domestication of the archive in his essay Archive Fever 1 J. Derrida, Archive Fever. A Freudian Impression, Chicago and London 1996. Luiza Nader: As Derrida argues, the archive’s driving force is the drive of death, which not only annihilates memory (construed as the process of remembering, memorising, as well as that of reminiscing) but also causes that which cannot be remembered to be radically erased. The archive occupies the place of the structural fracture of memory. Without the drive of death, and, therefore, without desire, there would, however, be no archive. The archive is thus an aporetic structure always working against itself. At the same time, it is a sign of the future – what is not archivised, dies in a way. The meanings generated by the archive determine its structures, the main principles of which are, as Derrida writes, repression and prohibition. Michel Foucault points out in The Archaeology of Knowledge that the archive is general system of forming and transforming statements. The archive cannot be described in full, nor can it be encompassed in its actuality. It appears in fragments in certain areas and on certain levels, and probably the more clearly, the greater our temporal distance from it 1 M. Foucault, The Archaeology of Knowledge, 1969.. A description of the archive reveals its potential starting with discourses that have just ceased to be our discourses. In itself, the archive is never critical or affirmative, but becomes a kind of discursive principle, restricting that which can and cannot be expressed in the given place at the given time. However, archives are never neutral, Allan Sekula points out in Reading an archive 1 Sekula, Reading an archive. Photography between labour and capital, w: The Photography Reader, Routledge 2003.: they constitute territories of images, exercise authority characteristic for accumulation, collection, inherent to the dictate of the lexicon and the laws of language. Their unity is imposed by their owner, or, as Derrida would say, by their administrator, their archon. The concept of the archive, Derrida notes in Archive Fever, carries in itself an echo of the word arche, meaning, on the one hand, cause, beginning, and, on the other – the original principle, law, order, authority. The archive protects in itself the memory of arche, but it also conceals it – forgetting about its etymological connections. In the case of the Latin word archivum, archium, it derives from the Greek arkheion, meaning house, abode, the residence of the archons. The archons, citizens exercising supreme political authority in ancient Athens, were also regarded as those entitled to create or represent the law. By the power of their authority, official documents were collected in their home, their abode. The archons were the first guardians of those documents, not only ensuring their physical security but also possessing the hermeneutic competence and right to interpret them. The documents entrusted to the archons spoke as law, demanded the law, and imposed the law. In ancient Greece, the archive developed in a kind of domestication, in house arrest. This scene of domestication, occurring at the interface of location and law, of substrate and authority, becomes both visible and invisible. Derrida deconstructs the archive viewed as the beginning, the source, or as the most direct form of getting in touch with reality, as a phantasm, pointing to the other component of its etymology: the archive’s directive power, its violence, as it were, to the dimension of power and authority, of law, through which the archive is established and which it imposes. The science of archives has to take into account the theory of their institutionalisation, Derrida argues. The theory of the law that both initiates the archive, forms part of it, and authorises it. The most important question that should be asked of the archive is: what is and what isn’t subject to archivisation? What is the nature of the process of archivisation? How are the meanings generated by the archive influenced by the kind of fundamental exclusion on which it is founded? Or, in simpler terms, how are archives constructed and maintained, and what social groups and persons are deprived of a voice in them? How is the archival material selected and prefigured? Who is passed over in silence in the archival structure? I perceive KwieKulik not as ambassadors but rather as self-proclaimed archons of a certain hidden narrative, a history of the exclusion on which the narrative of art history in Poland is based. The fragment of the PDDiU 1 Pracownia Działań Dokumentacji i Upowszechnienia we see here is an attempt to read the official archive of art history in Poland below the text, on the level of footnotes and annotations, from the position of those who have been deprived of a voice in it, whom the machine of history has made invisible. The KwieKulik archive is a paradoxical construction, formed at the crossroads, as it were, between defragmented document and memory – the metonymy of experience. In Made in USSR, GDR, Czechoslovakia and Poland, Zofia Kulik revaluates the writing of history by combining the private with the public, the informal with the official, revision with irony, replacing the concept of the origin with those of the trace, the imprint, the self-portrait. Zofia Kulik’s work has an open structure, and is governed by the law of seriality and repetition. It consists of a number of panels (to which others could be added or from which some could be subtracted) tightly filled with collages: reproductions and descriptions of selected documents from the PDDiU. The colourful, almost ornamental tableaux have not only been made using the technique of montage, which Zofia Kulik has employed since the late 1980s, but also using identical procedures. But let’s not be deluded: the PDDiU has been transformed, absorbed, as it were, by Kulik’s present-day artistic practice; the documentation that back in 1985 was presented in Banff as ‘speaking for itself’, here has been transformed into an ornamental composition. Kulik thus not so much presents as constructs the KwieKulik archive, constructs her statement using the KwieKulik archive as a kind of sharp tool. The montage of the colourful images is not only a mosaic of defragmented documents but also a montage of tropes of memory, of narratives. Zofia Kulik reveals the place from which these narratives originate: it is her memory, her experience integrated into the rectangles of the panels. Kulik reveals the narrational constellations she creates as particular, subjective, and, as every memory, founded on the ‘now’ of the logic of the field of art. The aesthetical form that Kulik lends to the documentation can be described as a narrational construction, and, at the same time, as a proposition of a history-writing instrumentation. She builds a fragmented, though quasi-chronological narrative, a passage, revealing the private and public dimensions of the PDDiU, between the archive’s domestication and its institutionalisation, between narration and the narrativisation of the past. Hayden White discerned between narration and narrativisation in the historical discourse. The former opens to the world and reports on it, the latter pretends that the world speaks for itself 1 H. White, The Value of Narrativity in the Representation of Reality, in: Critical Inquiry, vol. 7, no. 1, 1980, p.. Value, which is connected with narrativity in representing actual events, stems from the desire for these events, arranged in a cause-and-effect sequence, to appear as coherent, integral, full, to form a complete picture of reality. This value may be entirely imaginational. Does the world really appear to us in the form of well-structured narratives, stories with a clearly defined main subject, stories so coherent that we can see the ending in every beginning, White asks. Zofia Kulik composes the reproductions of the documents from the KwieKulik archive into a narrational form, and yet this is not narrativisation, we don’t get a coherent picture of the world, a narrative that speaks, a world that speaks for itself (as was the case in Banff in 1985) 1 Contemporary Art from Poland, Walter Phillips Gallery, Banff (Canada), 1985.. Instead, it is an attempt to get into the position of the speaking subject in the discourse of art history, and an intervention below – on the archaeological level. Kulik refers to the process of the formation and transformation of statements, but the discourse to which she refers is no longer her discourse (if it was, let’s repeat after Foucault, it wouldn’t find itself in the archive). And Yet Kulik doesn’t create an archive whose value would be measured by an authoritarian adequacy towards reality – instead, she tries to integrate it with other archives and the narratives based on them: the archive of the CCA Ujazdowski Castle, the Foksal Gallery archive. The constellations of meaning emerging in the process reveal facts repressed, as it were, into the unconscious of those other archives: in the case of Foksal, it would be the gallery’s links with the PSP, or, more broadly, the dimension of micro-power pervading the conceptual structure and dimension of the artistic praxis of the Polish avant-garde. In one of his texts, Krzysztof Wodiczko writes that avant-garde artists went where the money was for several hours a day, and in the afternoons they practiced truly independent art. And yet it is not this morning activity that was slavery, but rather that which was practiced as truly free art in the afternoon, Wodiczko says. The construction of the KwieKulik archive presented by Zofia Kulik can be seen as a kind of visualisation of what Wodiczko talks about: a record of the enslaving power of the ideology that structures the notions of art, freedom, or autonomy. Another possible interpretative key is provided by the motif of the archive’s domestication: the home as an archive, the existential praxis archivisation, but also the archive as a result of isolation. The KwieKulik archive points also to a certain deficiency of the discourses that defined art’s functioning in Poland: not only the limited flow of information, but also incomprehension, ignorance, the incompatibility of the intellectual references. The KwieKulik archive is constructed by Kulik fragmentarily, uses the figure of the synecdoche (its part speaking for the whole), resembles notes for a screenplay-to-be-written, yet, with the notes configured differently, it would be a different screenplay. Kulik isn’t interested in sources but rather in effaced traces, uncompleted projects, unfulfilled beginnings, that which has been ignored as not important, not artistic, not aesthetic enough in the editing of the history of modern art in Poland. As Hal Foster argues in An Archival Impulse 1 H. Foster, The archives of modern art, „October” no. 99, Winter 2002. , artistic practices based on the archival impulse constitute narratives rather than destroying them, their significance being legislative rather than transgressive. Such works, just like Kulik’s work, are not only based on informal archives but also create them: organising them in keeping with a certain quasi-archival logic, revealing the archive’s subject matter: facts both found and constructed, actual and fictional, public and private. Similarly to the artistic practices based on the archival impulse discussed by Hal Foster, the KwieKulik archive is a place where a shift is made in the way the archive’s function is construed: not as a ‘mine of meaning’ but as a ‘construction of meaning’ taking place in culture, originating in a sense of the failure of cultural memory and of the lack of any tradition that could be referred to, assuming for fragmentation as the condition of not only representation but also of Durcharbeitung. So where does Zofia Kulik’s archival impulse come from? What kind of motivations lie behind the thousands of choices made with each fragments of the documents? What kind of repression does Kulik perform on her own construction of the archive? And finally, what is the future of this archive when her narrative ends? Kaja Pawełek: The exhibition Made In USSR, GDR, Czechoslovakia and Poland comprises two parts. Part one are the Ambassadors of the Past and Holbein’s Floor, inspired by The Ambassadors, part two is From the KwieKulik Archive. The most important thing in part one is, for me, the double self-portrait in which the artist presents herself with Przemysław Kwiek – their duo appears for the first time in her individual work, being, at the same time, a double self-portrait referring to a certain image from art history. One can discover many layers here, one of these are the iconographic and historical references, another one are the authentic documentary images from 1978 that were to be used as passport photos. The artists were ultimately refused passports – hence the image of the ‘ambassadors’ is, on the one hand, purely potential, and, on the other, ironic, because these are ambassadors that can’t go anywhere. You can say that, metaphorically, they are the ambassadors of new art surrounded by their instrumentation, by the instruments of the 1970s avant-garde that make this revolution possible. Hans Holbein’s Ambassadors are, of course, a very complex picture, being, on the one hand, in keeping with the spirit of humanism, an image of actual persons, humanists in the studio – the Renaissance lab room – but, on the other, has its symbolic level, which shows the limits of humanistic cognition by introducing the division between the celestial and the mundane. 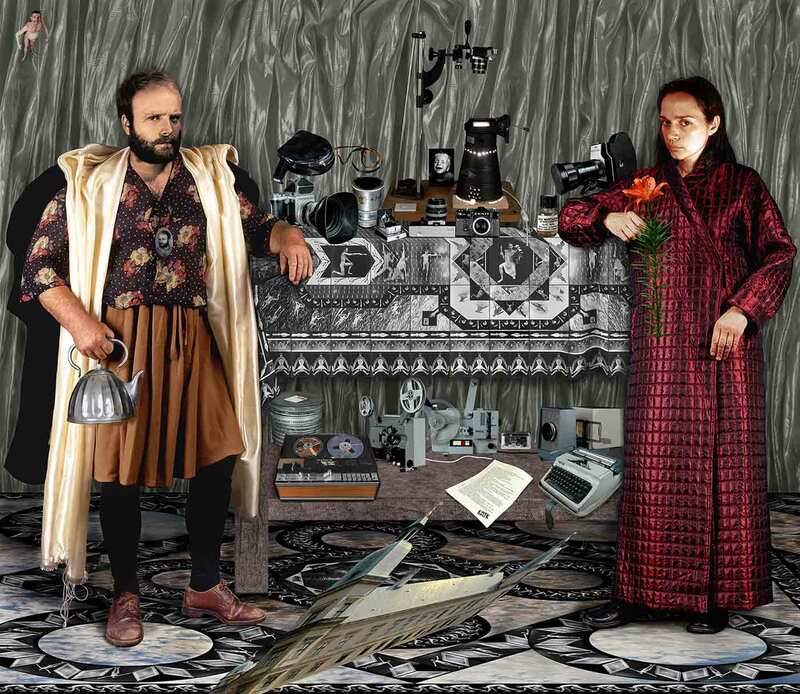 The technique employed by Kulik, that is, a photomontage of existing components, is typical for her work. What was important for me in the concept of this exhibition was the moment of reflection on what is now, what was then, and what will be in the future. Referring to what Luiza Nader said, the archive is for Derrida precisely such a projection of the future constructed now. What is interesting in the second part of the presentation – From the KwieKulik Archive – is the question of what it really is that we are looking at here. Is this an archive, an atlas, a collection, a collage, or a composition? I think it’d be difficult to call it a classic archive, because it is surely a form of presentation, or representation, based on the principle of the atlas, the panneau, or, even more, the tableau. It has a very strong visual and compositional dimension, and in this it differs from the archive, in the most basic sense of the word, as a collection of documents or a database. Perhaps this is why the archive is perceived in contemporary art as a more inspiring form than, say, a finite collection, created through systematisation and selection. To a degree, the archive contains the promise of the original without imposing on it secondarily any organising and finalising context, description, or interpretation, it has the potential of an original, unprocessed document. No aesthetic or thematic selection has so far been applied to it. The archive has also become a kind of safety valve, or such a mode of presenting art that can help us escape from the superior, curatorial discourse, or the discourse of great narratives in exhibition form. By presenting a database, an original set, and making it available to the viewer, the curator partly passes its knowledge on to the participant or recipient. 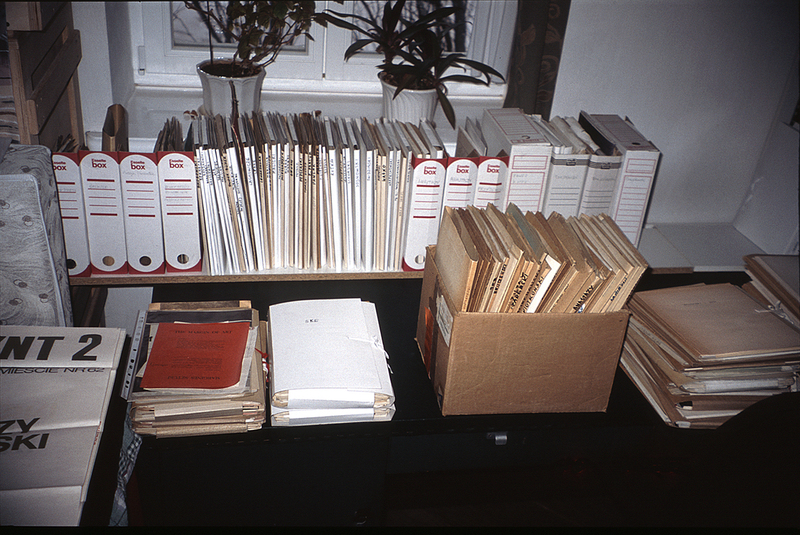 The latter can freely choose from the collection being offered – photocopy a publication, select a specific book, watch a single film from the entire programme, as was the case, for instance, with On Difference at Württembergischer Kunstverein in Stuttgart, or the project Her Noise Archive at Bergen Kunsthall. To some extent, at least, the choices are not entirely pre-defined here, the viewer has some, however small, room of manoeuvre. There also exist exhibitions or projects that themselves are structured like an archive, such as the Martha Rosler library presented in New York, or the e-flux Video Rental, which are mobile film or book archives (in Rosler’s case, these are the artist’s own books) that are often a presentation of the background, or original material, behind the given work of art or even the artist’s entire oeuvre. The phenomenon has also found a reflection in art criticism, where increasingly often we’ve seen a polyphony of voices or a polyphony of the critical discourse. Instead of a critical text, we get an interview or a collection of interviews, the transcript of a debate, where the participants often present even radically different views. With the criteria of art criticism being fluid and subjective anyway, such as polyphony appears to present the given phenomenon from various angles, avoiding being an authoritarian discourse based on weak foundations, and thus forms a more objective picture (if only through the sum total of subjective views). Returning to Zofia Kulik’s exhibition – it seems to me we are having to do here with at least two, if we stick to the term, archives. One is the archive of the visual documents collected by the artist and used in her photographic works. The other one are recordings of the artist’s own works, or those created during the KwieKulik period, and this, in turn, is a kind of documentation, determined, of course, by the specificity of the activities in question. It’s not solely a photographic documentation but also, according to the artist’s own term, an ‘aesthetic time-effect’, that is, an autonomous work in itself. The artist assumes here the role of the archivist, but also of the collector, and that is precisely why it could be interesting at this point to ponder on the difference between the archive and the collection. The archive changes into a collection when it becomes an aesthetic presentation/representation, or a kind of composition. There are many other tropes here – a very interesting one, in this context, is the borderline between the documental and the staged in these photographs. LN: I’d like to ask where the archival impulse comes from today, and where it came from then? You and Przemysław Kwiek talk a lot about that in many interviews, including in my favourite one, the book-length one with Maryla Sitkowska. My second question is connected with the first one: what kind of motivation lies behind the thousands of choices made in the case of each of these fragments? Or perhaps I’ll ask more emphatically: what is the game you play with this archive? As Derrida argues, every archive is constituted by repression. What has been repressed in your archive, and have you given thought to the issue of repression at all? And, finally, the most important thing: for me, this archive isn’t a Derridean archive in the truest sense of the word, it isn’t an archive whose place is the abyss, the structural fracture of memory. The archive you’ve constructed exists on the crossroads between memory and document, or between experience, the memory of experience, and document. Such a construction of the archive, in the form that you’ve given it, doesn’t exist without your stories. What do you intend to do with this archive? What is its future, because the future it talks about is something that, I hope, we’ll discuss. But what is the physical future of the tens of folders you have at home? Zofia Kulik: I don’t know the answers to the majority of these questions, or, more precisely, the answers can be found in what has been said here. I showed my mother in the film to show that it’s natural that I collect… what I collect. I collect other things than she did, but perhaps this collecting passion is something I’ve inherited. As for the future of the archive, for many years of my collaboration with Kwiek it was always a very open matter. My collaboration with Kwiek is a subject on its own. I often ask myself all kinds of questions in connection with his presence or absence when the things we once did together are presented. For many years, as an exceptionally obedient person, I believed that we collected for the purpose of something. But as years passed and that ‘something’ wasn’t happening, I thought it was because of external reasons, because of the political system that we had and because of which what we did wasn’t more public in nature. The years passed, from the late 1980s I was busy pursuing my new projects, and nothing happened with respect to the KwieKulik archive and oeuvre. The time factor is fundamental here. I was simply maturing to the idea that unless I did something – over thirty five years has now passed since the beginning of our collaboration in 1970 – everything would remain in this open and hibernated state. In fact, many consider this openness to be a value today. At some point, a dilemma emerged and a question to myself, a question I often ask in the presence of people asking me about my work. Should I busy myself with things past, with history? And in such a tedious, meticulous way? And it seems necessary to me because the KwieKulik practice was not about pure art, about making finite, close-ended works. Rather, it was a network of intimate connections between art and life… How to show it today? Some believe I busy myself with the past because I have no better things to do… Well, no. This is a dramatic situation for me when, on the one hand, I feel this sense of obligation, this motherly affection for those ‘other’, archival things, and, on the other, I don’t ‘practice’ my current, individual, work because of the lack of time. To make matters worse, I can’t work on this material in a unemotional, objective way. I’m not a professional museum curator. Hence my various ‘manipulations’, showing the old stuff accompanied by reflections and topical comments. Such as, in this exhibition, in confronting the KwieKulik archive with the Ambassadors of the Past, as I’ve tentatively called the large-format composition with the images of myself and Kwiek. In fact, popular demand for presentations of the past has been growing. I always try to show that the alternative art movement of the 1970s was very broad, I try to show the atmosphere where the artist was an experimenter rather than a ‘pro’, and also, however ambiguously it may sound, the culture of collective, group-based work. The work From the KwieKulik Archive isn’t the product of my imagination, my inner passion. I got an invitation from Ljubljana to take part in the exhibition Interrupted Histories… 1 Interrupted Histories, Moderna Galerija, Lubljana, 2006. In fact, the first letter spoke about the archive in general, so I thought about presenting my various archives. Then the subject was narrowed down to the 1970s, the idea being to show what happened in art at the time outside the institutions, what the institutions didn’t deal with – in fact, today they don’t deal with it either. Zdenka Badovinac, the exhibition’s curator, precisely defined the problem, characteristic not only for Poland. Our archive is the evidence of the existence of a non-institutional art movement in the 1970s. As far as the problem is concerned of artists in People’s Poland working for money, as mentioned by the previously quoted Krzysztof Wodiczko, I know the problem inside out and it wasn’t that you did one thing in the morning and a completely different one in the afternoon. Many artists in the world do things for money. Allan Kaprow, for instance, when he visited Poland, had old, worn shoes, and he said he earned his living by teaching in school, so it’s also a case of first ‘this’ and then ‘that’. The problem lay elsewhere: there existed an institutional monopoly in Poland on deciding what is art and what isn’t, let alone a monopoly for commercial jobs for artists – here the undisputed monopolist was Państwowe Przedsiębiorstwo PSP, an institution very useful for the regime. The art academies, in turn, existed to educate the performers of those commercial jobs. It was an unbearable situation. Our archive has always been divided into two parts: one part was KwieKulik, the other part were the so called Others, that is, other artists. In the slide shows that we held at our home in Praga, Warsaw, and with which we travelled to various places across the world, it was the same. The show was always divided into two parts. The fragment of the KwieKulik archive that I show at Le Guern gallery is the Polish version of the Ljubljana work, and in ninety percent it shows the work of other artists, because that was the request. This is a finite work, I deliberately used the frames, as the holy thing, to close this archival collage, so that no one can rummage through it and pick what they want. Returning to Kwiek’s absence, let me say that 1987 was the year when Kulik and Kwiek parted their ways. Only in 2000 did I try for the first time to show a fragment of KwieKulik’s work. Luiza Nader assisted me at the time in building the panneau Autobiographical Aggregate for the Grey in Colour exhibition at Zachęta 1 Szare w kolorze. 1956-1970. Galeria Sztuki Współczesnej Zachęta, Warszawa 2000.. I still thought at the time we’d be doing it together with Kwiek. Unfortunately, or perhaps fortunately, we entered the same old routine of arguments and quarrels that threatened to thwart the project altogether, because there was no time. Myself, with the experience I had gained doing my monumental photocarpets and the first version of the work From Siberia to Cyberia, I wanted to do something big. As a result, I decided to do it alone. I used a formula that was once used by Anastazy Wiśniewski who let himself be photographed, and then we, the authors of the photographs, presented him. In fact, it is an old dilemma of all performers, all performing artists – who is the author: the person in front of the camera, or the person behind it? As KwieKulik, we always insisted that we were the authors and the copyright owners of the photo, because it was our work. In fact, this is how copyright law regulates it: the person taking the photo is the author of the photographic ‘work’. But some treated the ‘recorders’ as ‘casual snappers’ and insisted that the performer was the sole owner of the ‘work’. Anastazy suggested the formula of ‘Anastazy as documented by KwieKulik’ and I used it too: ‘Kulik presents KwieKulik’. This installation is my work, though it is strongly emphasised, of course, that the content was once generated by KwieKulik. This is a formula that works insofar that I’m the more productive of us to, and Kwiek agrees to the whole thing, and to the extent that he helps me with the technical issues. His absence makes one thing easier for me: I’ve always stressed his pioneering role in what we called ‘for-camera actions’, in doing something on a combinatorial basis, when the given thing is transformed and every consecutive stage is recorded. The subsequent screening of these stages is the work. The essence of this practice was later repeated in the name of the Action, Documentation, and Distribution Workshop. We set up an independent institution at home, and it was a kind of surrogate of the public context. Distribution was carried out, among other things, the way that one of the panels of the archive presented in the exhibition shows. Being the owners of an apartment in Warsaw, and having turned it in the 1970s into a gallery, we spent the majority of our time entertaining guests, holding screenings, and discussing the art that we recorded. The purpose was to spread the message about the idea of processual art. In the photos you could see people that visited us. So we distributed, but, as it later turned out, to no avail, because, when the 1980s came, KwieKulik was a virtually nonexistent name in Polish art. This is reflected in the publications recapitulating the art of the period. Kwiek is usually missing from them, and I’m derived from places with which I felt no affinity at all. So my return to KwieKulik was provoked by, among other things, these deceitful publications. The question ‘what next’ has been asked. What’s next… after death? This is something for which I’m preparing my son, who doesn’t live in Poland, so I don’t have any influence on him on the daily basis, but a year ago we recorded an hour-long video where I walk around the house and show him what is important, and what is less important, what should be stored how. He’s got the tape. I often tell myself, ‘Just to have enough time to pack…’. BCz: I have the impression that with the formula of ‘KwieKulik presented by Zofia Kulik’, Zofia Kulik has pretty much answered the question about her intentions. I think that, as has been noted in several comments on the Made in USSR, GDR, Czechoslovakia and Poland show, we are having to do here with a very clear author’s narrative. Kaja Pawełek said that the archive was a database. I’d say that the archive can become a database. In the text that Luiza Nader referred to, Derrida polemicised with Freud on the belief in the archive as a kind of beginning, a kind of utopia of pure language. This can serve as a reference when we look at the narrative Zofia Kulik proposes in her work. It is a narrative far from being any kind of archival or objective language. It is a narrative that is very subjective and suggests a very clearly defined vision of the art of the period in question. I recall what Derrida said about the archive that it was a language of the past, but a language responding to very specific expectations of the present. Whereas here we are having to do with materials from the past, they also respond to very specific needs formulated from the present, contemporary, viewpoint. KP: This is also a commentary on institutionalisation. Several institutions appear in the works presented in the exhibition – among other things, we get the image of the Ujazdowski Castle, where the Centre for Contemporary Art resides. In itself, in turn, the KwieKulik archive is a kind of institution without frames. We also have a reference to an institution from the past, that is, the PDDiU. 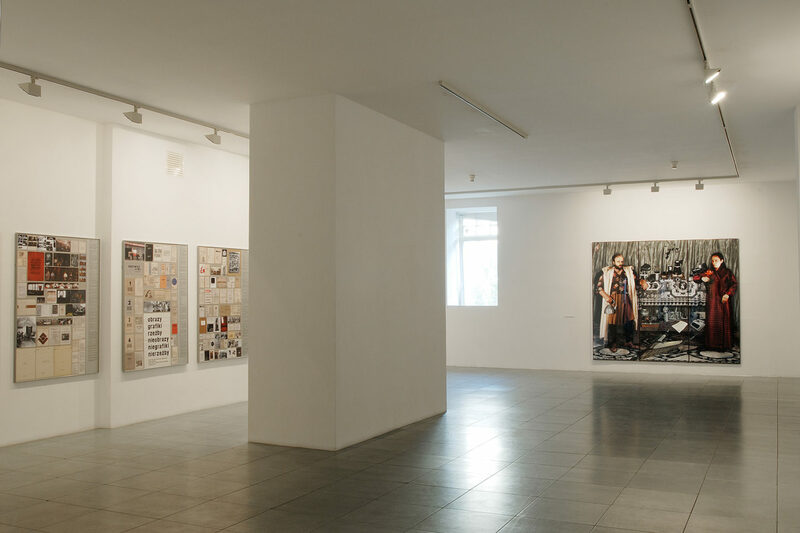 So where, relative to the theme of the Ljubljana exhibition, that is, interrupted history, the lack of presence in written or permanently constituted history, does this collection situate itself? Where should it really go and how would it look like if written history did exist after all? ZK: It’s the same story as with artists who, when they’re still poor and unknown, sell their works very cheaply, and as soon as they become known, or after they die, the prices start growing. What I have in mind is not money but significance. I remember how, in the 1990s, me and Maryla Sitkowska approached the CCA Ujazdowski Castle with the idea of creating some possibility of cataloguing and digitalising the archive so that it could be made available. I was willing to hand it over, not physically, but in terms of access. But because the whole thing foundered from lack of money to pay for someone’s half-time job, I decided that the decision-makers had failed to recognise the collection as being important for, let me use a lofty word, Polish culture. I never repeated the offer, and I never will. If it’s a no, then it’s a no. That’s why I can spin these mosaic narratives today and I laugh up my sleeve when I hear the astonishment that it has such a great aesthetic value. It does, because the art of the period was beautiful, and the artists had beautiful souls. In the form in which I present the fragment of our archive today it’s probably even more seductive than if it found itself on the shelf in some institution’s storage room. But, besides aesthetics, there’s a lot of information here. Each document has been extensively described by Agnieszka Szewczyk who assisted me in the making of this work. I recently viewed the CCA exhibition on Jerzy Ludwiński, it looked sad. At the Ujazdowski Castle, such exhibitions are always shown in the corridor because they are never treated seriously enough to be shown in one of the gallery rooms. And I don’t want to be shown in the corridor. Sylwia Serafinowicz: I’d like to ask you about the exhibition in Innsbruck 1 The Art of Eastern Europe, Orangerie Congress, Insbrück 2001. , where the KwieKulik archive was framed. ZK: It was the organisers’ decision. SS: Didn’t you have a problem with such a mode of presentation, emphasising the work’s visual aspect? LN: The first time I visited the exhibition, I was shocked, disappointed, very much against your proposition. I revolted not only against what you did with the KwieKulik archive, the way you aestheticised it, but also against a kind of the work’s commoditisation. I thought about it for a long time, perhaps this is something you didn’t plan with respect to recipients such as myself, who have certain expectations with regard to the way such works are curated. Today I believe that, through this aestheticisation and even commercialisation, this work is actually redeemed. If you had simply spread these documents on the table, you’d have effectively said, ‘use them, please, the documents speak to you, the world speaks to you’. But by presenting the PDDiU fragments in the form of these ornamental tableaux, you tell us clearly, ruthlessly even, that ‘no, these are my stories, my narratives, I build them’. Another issue that you’ve mentioned, and which is extremely important for me, is that of the access to the artistic facts that were ephemeral. We have access to them through the photographic documentation, but also via the mnemic experience. The communication of such facts will never be transparent. This is an impossible ambition. You can only achieve the delusive ‘transparency effect’, an illusion of transparency and fullness at the same time. ZK: I will keep trying anyway. I discern various levels of presentation; the basic one is that everything should bear a label, each negative, tape, etc. And this, by and large, has been done. The second level are, as I call it, the ‘bricks’. Each event is accompanied by its different micro-contexts, and the ‘brick’ should refer to these contexts: personal, artistic, but also social and political ones. The third level is selecting one or several ‘icons’ from the given event for quick and broad recognition. Interestingly, levels one and three already function, better or worse, whereas level two is largely missing. Wojciech Michera: We can discern two ‘extremities’ in your philosophy of presenting these ‘archival’ materials. One is the situation we’ve just experienced: we watched a film that you, because of the lack of soundtrack, accompanied by live commentary. The live commentary completely changed the film’s quality – it was an attempt to restore its original context that you confirmed with your voice and your presence. 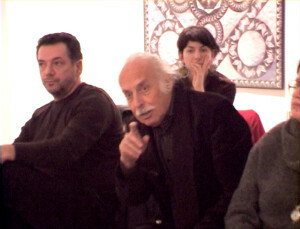 The result was a complex construction of the consecutive recordings that can be described so: a genuine artistic event takes place and is documented; the documentation finds its way to the archive; the archive is filmed; the film is shown to the public, but with your unique commentary. This voiceover commentary is not a recording and, as ‘living art’, returns, as it were, to the starting point. So this is one possible attitude, striving to restore the original context of the materials comprising the archive, however it is construed. I have the impression you feel an affinity with this attitude, the original contexts that localise, anchor each of the documents. The other attitude – which, I admit, I like more, is connected with what you said about the Innsbruck exhibition, a very decontextualised place, where the archival items were placed in a frame matched, like the passepartout, to the colour of the wall, so in a manner completely isolated from the presentation’s content. This is a procedure as significant as the above-mentioned situation in which the film was presented to us. It is also its diametrical opposite. Something that allows each of the elements of the presentation to appear on its own, and which cuts the anchor connecting them with the original context. Referring to Derrida, it is rather the orphaning of these materials that produces a situation where they ‘disseminate’ their meaning. LN: You’ve mentioned a very important problem – the ‘house arrest’ that this archive is subject to. ZK: I like the term ‘house arrest’. I’m a stationary artist, like the exercise bike, I pedal while staying in one place. I don’t like to travel. LN: It’s also the kind of control you exercise over your archive. WM: Zofia Kulik told us about her son. This is a sort of token, a metaphor of an attitude logically connected with the first of the situations I mentioned – a manifestation of the striving to maintain a kind of control over the meaning of these materials. I don’t judge this. This is a Platonic situation, the exhibition is Platonic in a way – thanks, precisely, to the spoken word which guards the meanings; and through its reluctant attitude towards ‘writing’ which is orphaned and, therefore, does what it wants. Yet this archive here is supposed to be construed in a specific way. ZK: Not only that – it is also to survive physically, because this is really very fragile material: the slides fade, the video disappears. I bought a special coca-cola fridge in which I keep the slides to ensure proper temperature. My approach to this is pragmatic and if I show my son around the nooks and crannies of this archive-house, it is because these documents – though here they look seriously and, as I said, even ‘seductively’ – can seem just a heap of rubbish to someone. Everything depends on who looks, because if it was someone interested in cars, clothes, money, he’d pack it all, throw into a container and took to the garbage dump. That’s what I’m afraid of. I’m not interested in control but in survival. Meanwhile, a wonderful thing happened, that is, the right technology emerged. I remember that, as recently as in the early 1990s, when Maryla Sitkowska was doing her interview with us, we received some subsidy and had a choice of either buying a computer or some hardboard to make panels with the photos pasted onto. Fortunately, we decided in favour of the PC, but it was a big fight because Kwiek wanted to make the panels. And from that moment on, our working method changed. I present only a handful of originals here, the rest are scans. They look like the originals, to the extent that Zbyszek Libera, who knew, for instance, The Confessions of a Dissenter by Anastazy Wiśniewski, came to the exhibition and was surprised that the publication existed in such a small format as well. He didn’t realise it was a small-format copy of the scanned original. Andrzej Turowski: I’ll formulate my reflections in reference to what Luiza Nader said. I believe Derrida’s remarks on the archive are meaningful, though I’d prefer for everything that Derrida says to be placed in his own context. Nothing outside it. Of course, the archive’s relationship with death is important, and not only with death, in fact, but with doing to death. Especially when we’re talking about ‘living art’. And the KwieKulik archive? When I saw Zofia Kulik’s archival works in the gallery today, I thought they were very nostalgic. A closed memory of the time of yore. There returned the problem of the archive as an act of doing to death, which I grappled it years ago, when there was so much talk about the archive. It is by no accident that, in 1971, as if in spite of the notion of the archive as a collection of dead things, we called the Foksal Gallery archive a ‘living archive’. Whereas we killed documentation, the idea of which was very popular at the time. The burying (or rather drowning) of documentation stemmed from the era’s idea of ‘art beyond form”, the art of the fleeting process, art that cannot be captured and preserved otherwise than after its death, that is, in documentation. As documentation had been put to death, we had to revive the archive as the means of ‘communicating’ art, as a place that is ‘neutral’, non-interfering, and which stores that which returns, which exists. It was a paradoxical reversal of roles, and at the same time a perverse form of institutional criticism. So what is the KwieKulik archive? An archive or documentation? I once likened Zofia collecting passion, in a catalogue of her exhibition, to a curio cabinet, while referring the assemblage structure of the thoughts contained in it to Aby Warburg’s Mnemosyne Atlas – and, further, to his view of the collage frescoes at the Palazzo Schifanoia in Ferrara. The peculiar assemblage of Kulik’s collection is a kind of ideological circulation of various images, fragments of images, parts detached from nonexistent wholes, seemingly and actually incoherent, coming from various directions, having different backgrounds – and suddenly found in this peculiar connection, and justified by it. What I saw in the exhibition today is not the ‘KwieKulik’ archive but a collection of curiosities assembled by Zofia Kulik. In 2004, in Toulon. 1 Fin des temps! L’histoire n’est plus/ Czasy skończone! Historii już nie ma, Hôtel des Arts, Toulon. I showed Kulik’s Gestures together with Witkacy’s Faces. In the juxtaposition, I wanted to emphasise that which, in the gestures of the puppet-model, had been frozen (put to death in the archive), and, in the mocker’s faces, revived (in the photographic documentation). I reversed my own history. Kulik’s frozen gestures are the repressive archive, a memory deprived of memory, a void from which all meaning has been erased. It is the genuine archive as ‘pure form’, at which Witkacy, hanging on the opposite wall, makes his faces. Point zero from which history can begin. LN: I’d like to remain unsure whether the archive is the death of memory… If we oppose the archive and memory, do we also oppose history and memory? AT: Yes, history with linearity, a continuity of events. There’s no continuity in memory, there are losses, sequences, time is reshuffled. LN: Of course. But how is postmemory 1 por. M. Hirsch, Family Frames: Photography, Narrative and Postmemory, Harvard University Press, Cambridge 1997 possible without an archive? It seems to me that the archive and memory, the notions of history and memory, shouldn’t be opposed to each other but rather considered as interpenetrating and controlling each other. AT: Agreed. The archive of culture controls that which is elusive, ephemeral, impossible to capture. LN: It seems to me that calling this set of works a collection rather than an archive deprives this work of what I’d refer to as its critical potential. If we consider the work to be a kind of collection, then it’s, of course, a very interesting perspective, but we refer to the selection, the relationships between the objects, to visuality. Whereas we don’t get down to the level of history-writing. What I’m talking about is the length of the drill that Zofia Kulik inserts here. I believe it’s not an archive but a certain construction of the archive, suggested by Zofia Kulik. It also seems to me that she doesn’t see death in the archive but perceives it as a kind of memory prosthesis instead. Ewa Mikina: I don’t know whether it’s a memory prosthesis. I’m more inclined towards thinking that views memory as a learning apparatus, where culture is co-created by historiography, these are kind of stages. The question is, what kind of archive we will now have when we archivise everything because we have the technology to do that, when we are turning the whole world into a contemporary archive, archivising ourselves. We think about ourselves as about those who were for those who will be, so we live in a rather novel temporal framework. We have redefined time, the time that used to be so ‘nice’, linear, precisely with the beginnings of historiosophy. ZK: Add the technologically facilitated multiplication of everything, photocopies, reprints… The question arises: for whom? Who needs all this? EM: For our historiosophy of the future. ZK: I doubt this. I don’t believe anyone will come, discover and put all this to any use. EM: It’s rather us who need this, it’s our notion of ‘posterity’. Memory is something else entirely, it’s before history, its functions include forgetting, erasing, shifting stories, and so on. History, the archive, is about recording. A living memory, consolidating images of the world prior to the emergence of historical thinking, has nothing to do with images-as-recordings. You have to differentiate between these two types of memory. LN: But people keep coming here and discovering? ZK: They do, but I think about what’s next… these ‘panels’ will return to me and then what?